It’s official, I’m a Quinn Fangirl. This book has been on my reading list for a while, but I had to get through publishing my latest in my series and I had a couple of books ahead of this. I finally got to it just the week before my ‘break between writing books’ ended. And boy am I glad I did. By the third chapter this story grabbed me with iron hooks and sucked me into a powerful vortex and a week later I emerged having read every single one of Ms. Quinn’s books. I couldn’t stop. I wouldn’t stop. I hoped fervently she wrote under a pseudonym so I could find more books, but no dice. Yeah, it was like that. One more point before I’m on to the review. This book isn’t a paranormal shifter novel and has absolutely nothing to do with a Lynx cat. Instead, it is ohh so much better . . .
Lexi is orphaned a year before the story takes place and a fire forces her out of an apartment building where she’s lived as part of a close-knit community all her life. She’s been unschooled. By that, the author means she hasn’t gone to traditional school, but has instead been tutored by and has apprenticed with many people. Some of these people she calls her Grandma’s. They’re six elderly women of different ethnic backgrounds who teach her different languages and cultures. Other tutors are more specialized, such as her training to fly airplanes, her martial arts training by Master Wang, or her training by Spyder, a special undercover operative of a group called Iniquus. Lexi also has some special psychic and supernatural abilities. She can perform Reiki, which is a method of healing using energy transformation, she has psychic ‘knowings’, she can perform simple searches for lost things, and most startling of all, she can go ‘beyond the veil’. I’m not going to tell you what that is, but let me just say, it is freaking cool. It happens during the most shocking climax of the book. Spyder recognizes that Lexi is a genius operative in the making as a young teen between her unorthodox education, her martial arts training and her supernatural abilities. She becomes his secret weapon and puzzles out complex crime scenarios to find the truth. All of this so far is background and as you can see, it’s very rich. The story really starts the day after Lexi’s wedding. It opens with Lexi on her way to speak with her friend, a father figure, to tell him about a threatening note she received on her wedding day. She’s near tears and scared out of her mind because her husband left for service in Afghanistan that morning and she’s alone. She didn’t tell her husband about the threatening letter because she didn’t want him focusing on her when his life was at stake on his own mission. She’s never been the victim of a crime like this, or involved in dangerous situations before. She’s only lent her mind to puzzle out the crimes against other people. The person she really needs to speak with is Spyder, but he’s been undercover for about a year and a half after the last big case she puzzled out. She hasn’t heard from him and though he suggested she go to a man named Striker if she has problems, she is independent enough not to want to get their help. Since she’s been working directly in secret with Spyder, she doesn’t even think they will believe her. Well, after more threatening notes she realizes she’s being stalked by a crazed serial killer. I can’t really tell you more without giving away major plot points. The story covers some brutal scenes and holds a strong thread of romance. This is a phenomenal story. We have a serial killer, a team of hunky special operatives, supernatural powers, a genius heroine, and romance. What more can you possibly want? You can want the next two books in the series and more that the author hasn’t even written yet. And you will. You will want it bad . . . Thank you so much, Juneta! Hi Doris. The link to the first book on Amazon is at the top of the post. I know you will love it! Hi Doris, thank you so much for your interest. 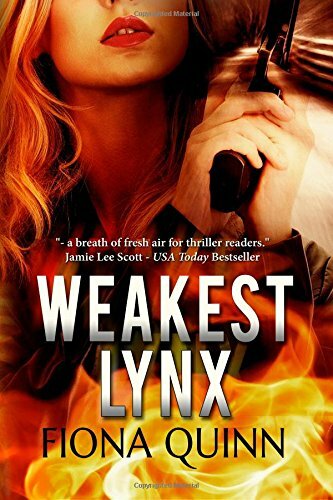 Books 1,2 and 3 (Weakest Lynx, Missing Lynx, Chain Lynx) are available and this fall Book 4 Cuff Lynx will be out. I hope you like them! Want to read it. Has it released yet?